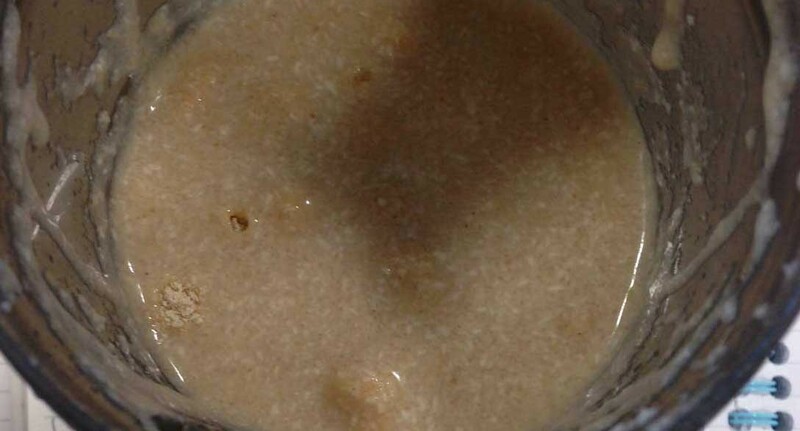 It was a sunny Friday afternoon when my friend excitedly sent me a link to the website for Huel, a new nutritionally-complete powdered food ala Soylent, but manufactured in the United Kingdom. 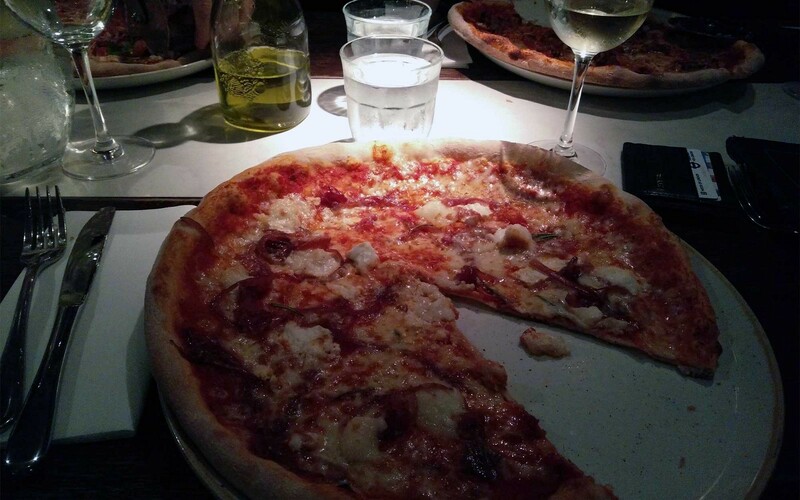 Within minutes, we’d ordered about 13kg of the stuff, and decided that we’d be living off it for the next week. Why all the excitement? We’d both been closely following Rob Rhinehart’s Soylent for a good while, and had become increasingly frustrated waiting for it to become available in the UK. 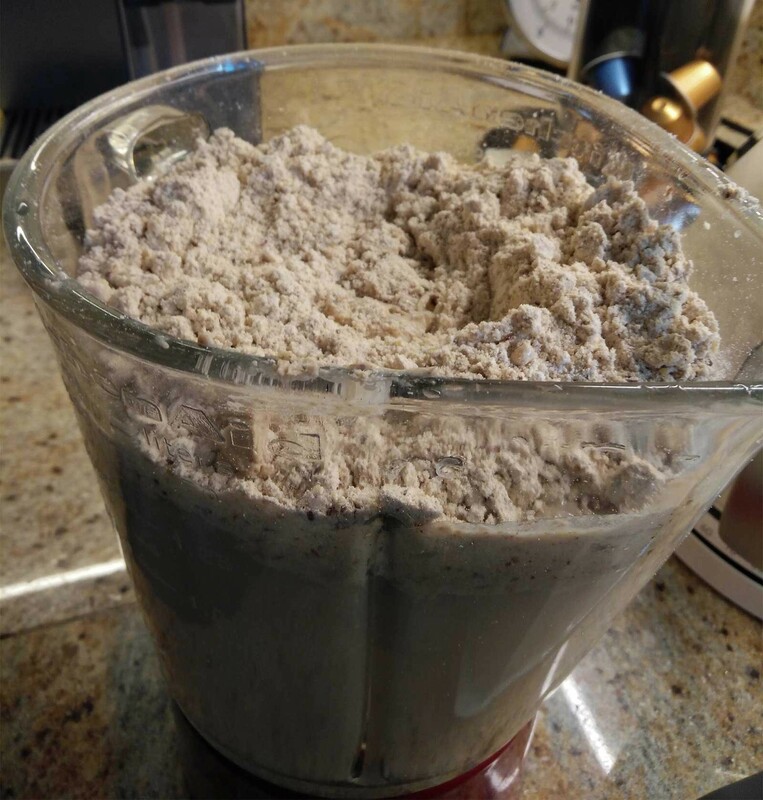 So impatient were we that about a year before, we had followed an online recipe (Soylent is open source) and bought the constituent parts to create our own Franken-Soylent. Imagine the world’s thickest milkshake, made by the world’s most sadistic milkshake-maker. Did you ever play that game as a kid where you’d mix different sauces from your fridge into one deadly concoction that you’d dare each other to drink? Well, it didn’t taste like that, but my body categorically rejected the liquid in the exact same way. It didn’t taste like a food and didn’t taste like a drink; it was stuck in the uncanny valley of edible materials. Franken-Soylent: the official drink of the Four Horsemen of the Apocalypse. 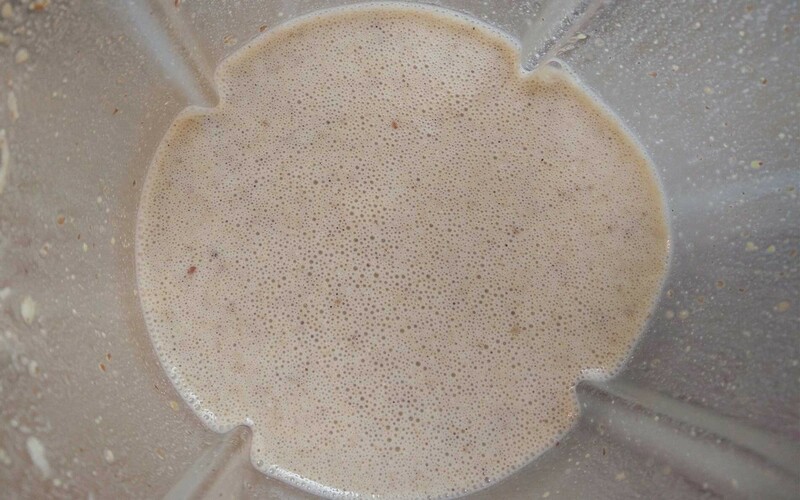 So you can imagine our joy when someone with some actual culinary skill had taken it upon themselves to mass-produce a Soylent-type drink in the UK. Plus, Huel was even better than Soylent for my dietary needs — it’s higher in protein (30% compared to Soylent’s 20%) and pretty much perfectly resembled the carb/fat/protein split that I already consumed on a daily basis. The plan for the week was to consume Huel and only Huel: each and every bit of energy (apart from incidental chewing gum calories) would come from this off-yellow powder. What would it be like to live off a futuristic superfood? Would I make it through? Would I use the free time gained to finally start that multi-billion pound business I keep putting off? All questions would soon be answered. 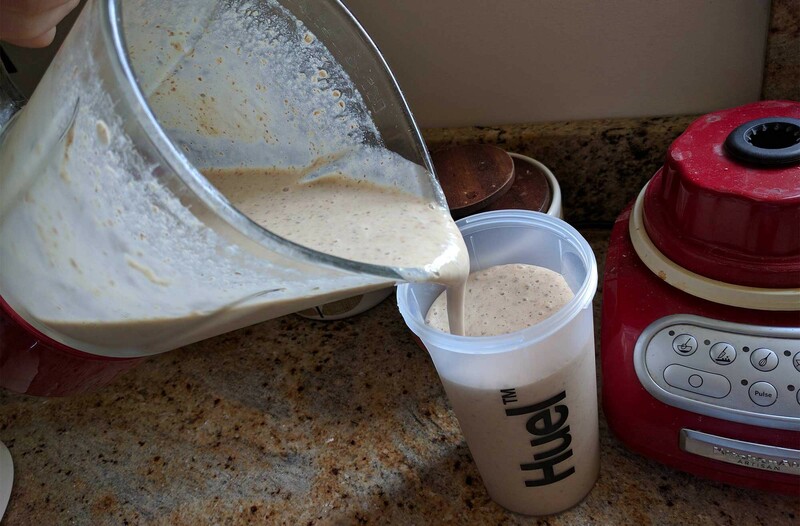 We recommend that when you start your Huel diet, you first try replacing 1 meal with Huel, and then after a while you could progress to replacing 2 or more of your daily meals. This will allow your body to slowly adjust to Huel. It is possible that when you start Huel for the first time that you will experience flatulence and irregular bowel movements, tiredness and/or cravings, depending on how healthy your diet was before. However, this will settle down as your body adjusts. 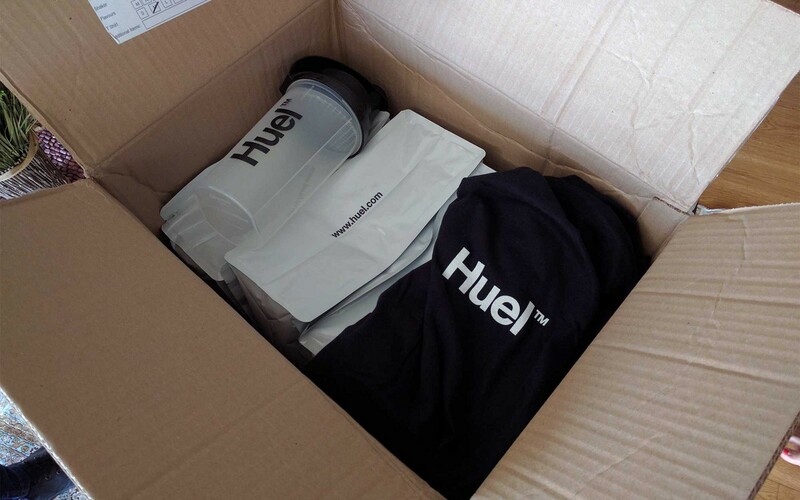 The Huel arrived the following Monday in a big box, with a free branded t-shirt and shaker (nice!). In an effort to stop it resembling my recent concoction and setting off my Post-Traumatic Soylent Disorder, I blended it well, and added some ice to get it to a nice chilled temperature. First thoughts — not bad at all! It definitely still had that weird oat-type flavour/smell that I associate with these types of drinks, but the vanilla flavour was convincing, and if I tried hard enough, I could pretend the little brown specks in the drink were chocolate bits. The first 122g slid down quite easily, although it was a little thick (I took a mental note to use more water next time). What struck me was how filling just 122g (or 500 calories) of this powder was. The volume combined with the flavour systematically destroyed my appetite, which became a problem that afternoon when I needed to down my second portion. A lot more resolve was needed this time round, but I made it through. By the evening, I was being seriously tested. My body was starting to realise that today was no normal day, and felt a little… off. My next two portions gave me something I’d never felt before — the feeling of being both extremely full and extremely hungry at the same time. Like, I knew that I had what I needed in my body, but I felt overtaken by a primal desire to just chew and swallow something. All this was forgotten, however, halfway through my final shake for the day. I felt a rumble, deep inside. This is what seismologists call a ‘foreshock’ (trust me, I looked it up). I ran to the toilet and had what I will describe — for the purposes of keeping this blog readable — as a ‘non-standard bathroom experience’. I was shaken (no pun intended), and went to bed an empty man. My Huel journey had begun. Over the next couple of days, I experienced a mixture of feelings. Relief: The Huel was not nearly as hard to drink as I thought it would be, as long as you didn’t expect to finish it quickly (I’d usually sip it at my desk over at least an hour). It was about 100 times tastier than a whey protein shake. I realised quickly that one of the biggest challenges would be finishing four portions in a day — each drink felt like a big undertaking. Superiority: Fully vegan and sustainable, Huel made me better than everybody else, and I let them know it regularly. Calling my friends ‘mindless food-eaters’ and reminding them that their archaic eating traditions were dying out brought me great joy in this period. Fear: Trumping all else was the fear that at any moment, the Huel could decide to exit my body, in a rush. In my most dire moments, I took to whispering a sentence from the Huel FAQ sheet to myself repeatedly… “this will settle down as your body adjusts… this will settle down as your body adjusts…” On the flip side, whilst I was expecting a lot of ‘wind’ due to some (hilarious) early reviews of Soylent, I actually had less wind than before (this could also be due to the extra time I’d been spending on the toilet). I didn’t feel like I’d made proper use of my new free time yet — partly because I was still spending quite a bit of time messing around with different ways of blending the Huel, and partly because it takes a lot more than that to overcome a lifetime of procrastination. Huel-words were already slipping into my vocabulary: instead of meeting my Huel-buddy ‘for lunch’, we’d meet ‘for a sip’, which allowed us to feel like we were part of some super-exclusive group, rather than face the reality that people were most likely starting to avoid us and call us ‘Huel wankers’ behind our backs. On days 4, 5, and 6, I really hit a wall. A big, off-yellow, vanilla-flavoured wall. The problem with this wall wasn’t the flavour — no, the wall tasted good — it was that I couldn’t rip off some nice solid chunks of the wall, chew them into little pieces and swallow them. Everything in me seemed to yearn for something, anything, more than the vanilla soup that I glugged down four times a day. It wasn’t a problem with my stomach, because I felt fairly satiated. It was my brain. 26 years of daily habit-building were fighting against this new liquid diet. I craved the act of chewing, the feeling of having solids in my stomach. In my spare time I would flip through food photos on Instagram and at night I’d lie in bed watching military ration reviews on Youtube (these are surprisingly fun to watch). I flirted with the thought of eating a bit of celery, just to feel alive again, and it took all of my mental power to avoid it. On the plus side, my bowels were starting to steady up. They’d put up a noble fight, but had clearly realised that resistance was futile. My entire body felt lighter, mainly because it was lighter: I had lost about 1.5kgs in water weight, probably because the Huel was so low in sodium compared to my normal diet. By Saturday night, a couple of things were evident. One: I would never take food for granted ever again. Two: from where I was standing, the future of food looked pretty bleak. On Sunday, somehow, everything changed. The food cravings were gone, my stomach felt fine, and I gladly chugged down my Huel without a worry in the world. I decided that the past few days of suffering were simple me being my usual melodramatic self. Had the Huel finally broken me? Or had I achieved some sort of futuristic post-foodstuff nirvana? I don’t know, but all I can say is that when it came to the celebratory meal on Sunday night, I felt at peace. Happy to indulge, but not dependant. I had finally freed myself from the shackles of food consumption, and let me tell you, it felt amazing. My drought-breaking Sunday night feast. That was 6 weeks ago. I’m happy to say that since then, I’ve been in a steady relationship with Huel. I’ve scaled back my use, but still drink two portions per day, replacing breakfast and lunch, and then have real-person food for dinner, which I’ve found is more than enough to fulfil my food cravings. All the while, I’ve become more and more reliant on the stuff, to the point where I would struggle to go back to normal lunches, at least when I’m at work. The liberating sense of not having to plan what I’m going to eat every day is quite addictive: I simply throw it in my bag, shake it with water at work, and sip it whenever I want. No more worrying about preparation, price, nutrition. I’ve even bought one their ‘flavour systems’, mocha, which alleviates the boredom that comes with constantly drinking vanilla shakes (to an extent). 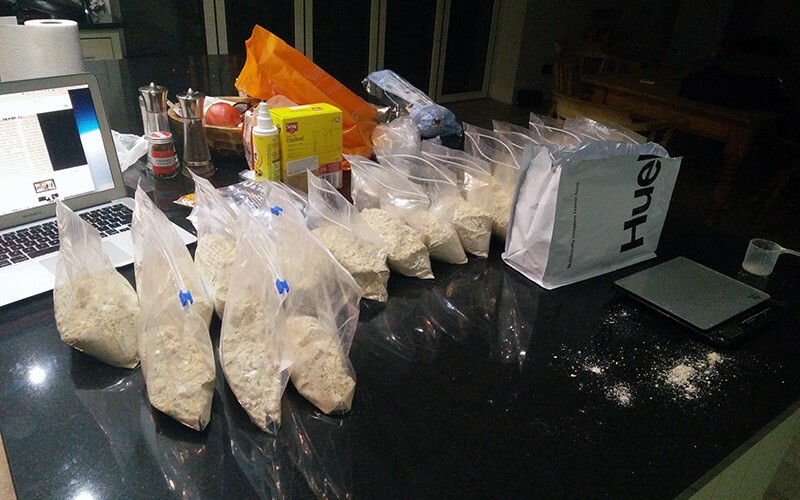 My one complaint is that in order to split the Huel into separate bags for transport every month, I end up having to turn my kitchen into something resembling a heroin lab. This takes time and uses so many plastic bags that I most probably cancel out any environmental good I’m doing by drinking it. Selling it in separate bags or premixed bottles like Soylent offer would be a great next step for the company. So there you have it, my transformation from normal human to Huel addict. Recently, I’ve even become somewhat of an evangelist. I often wear my Huel shirt to the gym, and have had a lot of people approach me asking me what I think of the stuff. If anyone from Huel is reading, please do let me know if there is some way I can make some cash out of this. Love them or hate them, nutritionally-complete powdered drinks are here to stay. They’re changing the way people think about food, and although most people I talk to wretch at the thought, we might be in for a vanilla-flavoured future if we end up going and melting those polar ice-caps. On a personal level, it feels like my Huel journey is just beginning. Onwards and upwards. If you enjoyed this article, follow me on Medium or on Twitter (@jamchiller) for more content. I’m currently in the process of writing a one year update to this article, so keep an eye out.